Below is a Diagnostic Report (for Dayle - Dayle Whiting Motors, Te Kuiti) where the customer was complaining about the car "having no power on the road" and "running rough at idle". The car was scanned and there where no fault codes in memory. 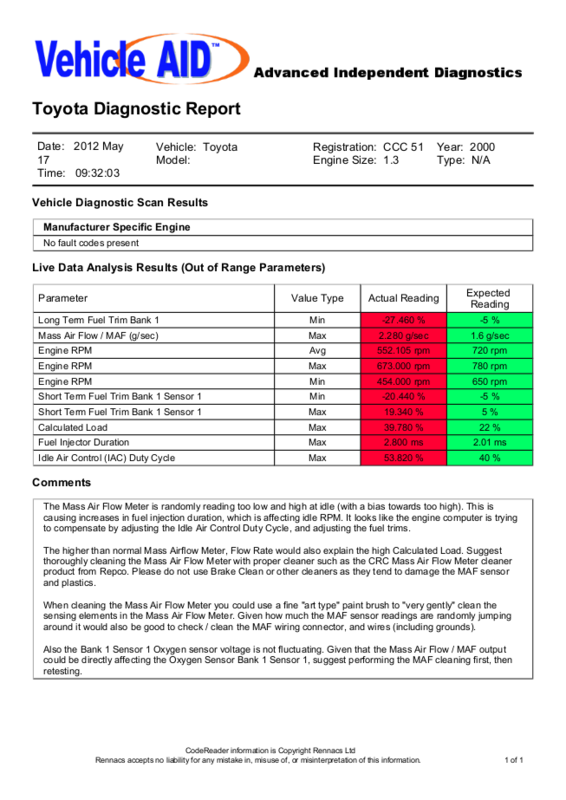 They requested we use the Vehicle AID system to analyse the engine (results below). You can see that even though there were no fault codes, the Vehicle AID system quickly finds what Live Data values are out of range. The comments in the report give detailed analysis and the suggested actions to take to test / repair the fault(s). As some engine parts (such as the Mass Air Flow meter) output can directly affect other sensors (such as the Oxygen Sensor readings), we always recommend focussing on engine sensor inputs (such as the Mass Air Flow meter) first. Once the inputs have been diagnosed all OK, then it is safe to properly diagnose the output and feedback sensor (such as the Oxygen Sensors) and replace if necessary. This is the graph of the Mass Air Flow meter (MAF) at idle then engine revved to 2000 rpm. The red line and "sample point dots" should fall within the shaded area as of this graph. MAF was cleaned and this helped but did not fully fix the problem. This graph is of a new MAF and shows that the sample points now fall within the green shaded area, so that fixed that part of the problem with this vehicle. Now that all input sensors and engine data is within acceptable limits (by comparison to our database), we can now confidently test the Oxygen Sensors. This graph is of the front Oxygen Sensor with the engine at operating temperature, and engine revved to 2000 rpm. It shows that the front Oxygen Sensor tries to switch once, but is basically not responding. This graph is of the replaced Oxygen Sensor. You can see that the sensor is now switching correctly.